Public relations is the art and science of proactive advocacy on the part of acompany, individual or brand. It requires strategic management of your positionstatement and key messages in order to reach your target audiences, andthrough various tactics, establish good will and a mutual understanding. In short, effective use of public relations tools allows us to shape public opinion, attitudes and beliefs. Utilizing public relations is much like crafting an openingstatement for a jury trial: you will painstakingly strategize about which facts youshould initially reveal to the jury, which heartstrings (if any) you want to tug,the tempo and timing of your delivery, and the information you deliver last inorder to achieve a long-term impact. 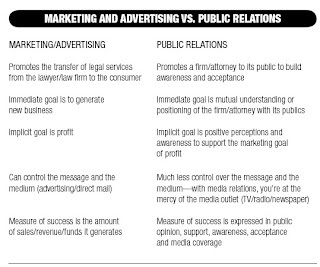 The public relations portion of your firm’s marketing must be a strategic part of a carefully considered marketing plan so that it complements the branding,advertising, business development, client services, sponsorships and othercommunication initiatives. The role of public relations is to help build thefirm’s brand equity by delivering key messages to target audiences to elicit aparticular response and thus shape public opinion, attitudes and beliefs. Inother words, PR is the method by which we communicate messages about ourselves, our firms, and our understanding of the law and the cases we handle onan everyday basis. The practice of public relations differs from marketing andadvertising. PR promotes and builds awareness and acceptance; the immediategoal is often based in the positioning of the firm; you have less control over themedia placements; and the messages tend to be viewed as more credible. "Everyday Public Relations for Lawyers is incredible! I definitely learned a ton. I love the quotes at the beginning of each chapter too - they share great inspiration and great advice for any professional." - Alicia MacGlaughlin, Masters of Secondary Mathematics Education, Teacher of High School Mathematics, Delaware County, Pa. I read your book and it's dead on. Great work. Every should get his hands on Everyday Public Relations for Lawyers.